Nik Software has made their Color Efex 3.0 post-processing suite available in trial download and upgrade versions. The highly-anticipated set of filters and processing plug-ins was first seen at PDN Expo in New York City earlier this year. Want a self-portrait but don't have a tripod or someone to take the photo for you? Quik Pod for DSLRs is your answer. This second generation of the original Quik Pod is new and improved, and can stretch up to 4.4 feet (1.3 meters) and comes with comfortable accessories such as a gel pad to brace it against your body. It also works well for the over-the-crowd shots when you want a unique perspective. When collapsed, the pod is very compact and takes up a very reasonable 18 inches (135 cm) and weighs only 9 ounces (250 g). Although it's rated for up to a 2 lbs (1000 g) load, a YouTube video shows it holding an amazing 28 lbs (12.7 kg) steel block! For owners of the D300 and the anticipated D3 cameras, Nikon has released emulation mode software using the new Picture Control function first revealed in the View NX software. This program will allow the D3 (Windows or Mac) and the D300 (Windows or Mac) to emulate current D2X Color Reproduction in all three hardware color spaces. This will be useful for former D2X photographers who have priority shooting needs and cannot immediately recalibrate their color workflow from their legacy cameras. Editor's note - this program does not replace the need to recalibrate your color workflow; it should be seen as an expedient tool for professionals and other photographers whose shooting requirements cannot allow them to immediately recalibrate. 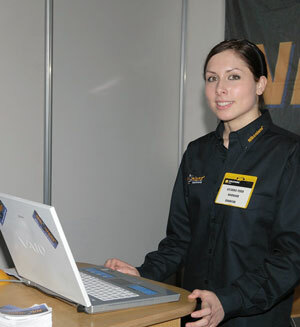 Nikon has released RAW Codec 1.1.0 which gives the Vista operating system the ability to read D300 and D3 RAW images. Photographers seeking more information on the hot new cameras of the season should check out the Digitutor sessions on the Nikon D3 and the Nikon D300. Nikonians north of the US border are seeing benefits thanks to the weak US Dollar - lower prices on many digital cameras and accessories. And to add icing to the cake, Canadian members are reporting the D300 is now available on the shelves. As a follow-up to our October report on the Eye-Fi card, the Wall Street Journal's Mossberg Solution column recently ran the card through it's paces and was suitably impressed. Bottom-line: this is a must-have for the shutterbugs on your holiday shopping list. This will be our our biggest year ever and we are continuing our tradition of excellent workshops in a small class environment. We are covering more cities and more dates than ever before. At this point we have 28 cities listed across North America, including Houston, Los Angeles, San Francisco and Vancouver BC in January. Additionally, we have a number of travel workshops that we'll be running in locations like Moab, Banff, Olympic NP and many more. These travel workshops will all be posted over the next two weeks. 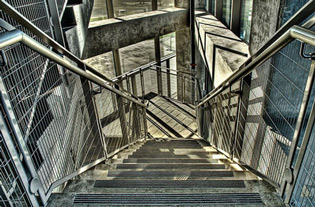 Go to www.nikoniansacademy.com to see what all the fuss is about! Sign up quickly before the limited number of seats sell out. We have an entirely new workshop on the Nikonians Academy schedule called "Streamlined Digital Workflow and Inkjet Printing". This is a one day hands-on workshop where we'll be providing large format HP Photosmart Pro B9180 Printers for the class participants to use. We'll cover digital workflow, software, calibration and printing with a goal to help you better understand the process of digital workflow and inkjet printing. We have also created a four-day workflow, software and printing workshop called "Advanced Digital Imaging Workflow" that will be held in two major cities in '08 (San Francisco Bay Area and Dallas). These four-day workshops will have a complete digital darkroom setup with printers, computers and calibration equipment. We'll have thorough tutorials on Photoshop methods, Nikon Capture NX, HDR imaging, RAW workflow, large format ink jet printing and much, much more. These two events will provide an unbelievable amount of information over the course of four days. If you are serious about learning printing, workflow, RAW processing, then this is the workshop for you. Photographer of the Year 2007 Segment #5 Winners! The new 18-55 DX VR lens! D300 hits the shelves and Capture NX 1.3 is upgradable for Windows and Mac. Nikon Canada requires certification letter from Pros after the new D3. The sale of a Lecia camera from 1923. Your Camera Does Not Matter. Nikonians have been reporting the arrival of the much anticipated D300 in both pre-orders and store shelves. Capture NX 1.3 has also been released, so it should be a very festive time for all. And if you have D300 questions, be sure to join our forum to get answers! 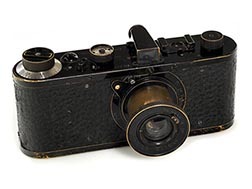 A black "pocket" Leica camera of the 1923 limited series 0 edition was sold for 336,000 Euros (US$492,300) at the WestLicht Photographica Auction in Vienna Austria, the highest price ever paid to date for an item of this type. The buyer is a private collector who acquired the camera with serial number 107, making it the most expensive Leica camera ever. This camera is part of a set of 21 prototypes created by Leica to confirm market viability for "pocket" cameras. What further makes this camera unique, is that it was the first exported Leica camera, when sent to New York to the US Patent and Trademark Office for application. At a previous WestLicht auction in May, a Daguerreotype by Susse Freres of France, built in 1839, fetched 588,613 Euros (US$862,400), which WestLicht said made it the world's most expensive camera. It's holiday season again, and The Image Doctors bring you their annual holiday gift suggestions. This episode is brought to you by Bogen Imaging. Episode #54 of The Image Doctors is brought to you by Bogen Imaging. With only an extra two ounces in weight and mere fractions in length differential, Nikon's DX lens inventory now offers an upgraded option for the standard "kit lens" previously available for their DSLR's. 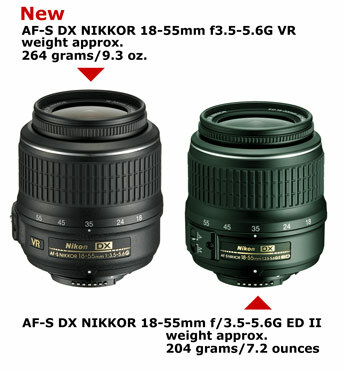 Extensive testing and customer opinions will be the deciding factor on whether the new AF-S DX NIKKOR 18-55mm f3.5-5.6G VR will outsell the AF-S DX NIKKOR 18-55mm f/3.5-5.6G ED II kit lens version (announced almost exactly a year ago this week). Depending on where you shop, last year's non-VR 18-55 can be found for as low as $120 USD. Nikon's Press Release, issued today, puts the suggested retail price of the new lens at $199 USD and forecasts a December 2007 availability date. Nikonians, the worldwide home for Nikon users, are preparing to meet professional photographers with the same brand loyalty during the upcoming Nikon Solution expos in London and Cologne, Germany. We will be participating at the Nikon Solutions Expo in London November 27th and 28th and at the Cologne Nikon Solutions in Germany, November 30th to December 1st. These two expos will feature your chance to get a close look at the brand new Nikon D3 FX format professional DSLR and the D300 and the full range of Nikon's new professional products. We're also looking forward to gathering the latest product news from the event co-sponsors, which includes our Corporate Partner HP. Our call for volunteers has been answered with enthusiasm and we have only a few more opportunities for community members who plan to go home with a Nikonians T-Shirt and a Nikonians Baseball Cap for spending a short time assisting us in handing out flyers. 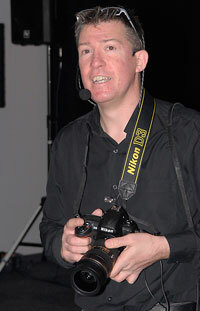 The events are hosted by Nikon UK and Nikon Germany and entrance is free of charge. Please note that online pre-registration is required - available on the expo websites. Support your community by arranging in advance via email to meet with us at our London Booth 110 or our Cologne Booth 175. Contests Director Chris Gray (wpgf100) has contacted the winners of Segment Four in our Nikonians Photographers of the Year 2007 Contest, letting them know they have earned prizes in their categories. The First Place winners have also been selected to move on to the finals of this year's contest. 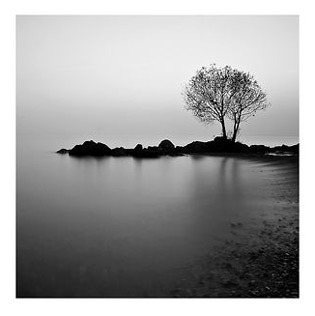 First Place - Frederic (fmottier) Mottier of Switzerland, for "Lake Geneva" - The winning entry earns Frederic a Spyder 2 Pro from datacolor and a seat in the finals. 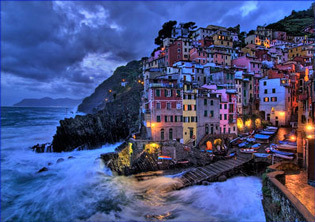 Second Place - Lyle (Lag) Gellner from Canada, for "Riomaggiore" - The winning entry earns Lyle a ScanJet G4010 photo scanner from HP. First Place - Lyle (Lag) Gellner from Canada, for "Shadows and Light" - The winning entry earns Lyle a SilverFast DCPro Studio from LaserSoft Imaging and a seat in the finals. Second Place - Howard (Ho72) Owen from USA , for "Light Well" - The winning entry earns Howard a Glass Taxi convertible backpack/shoulder bag from Think Tank Photo. First Place - Joe (skorj) Iannandrea from Canada , for "Is it Half Time Yet?" 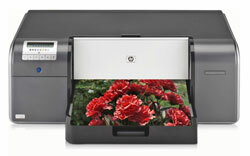 - The winning entry earns Joe a Photosmart A618 Compact Photo Printer from HP and a seat in the finals. Second Place - Geoffrey (djbahdow2101) Bolte, from USA, for "Beating the Defender" - The winning entry earns Geoffrey Capture One LE software from Phase One. The Nikonians Photographers of the Year 2007 Contest is open to all Silver, Gold and Platinum Members. All entries are judged by a panel of expert Nikonians photographers who cast their vote on the photographs received within a given period. Segment 5 is currently being judged. This segment concentrates on Wedding, Wildlife and Open categories. Need a Nikon D3 in Canada? Prove It! Nikonians have been following an interesting pre-sale development as the release dates for the D3 and the D300 approach. Nikon Canada has taken the unique step of requiring a certification letter to prove that a pro photographer will take possession of the camera and the intent is not to resell. The Photozone Review of the 24-70mm f2.8 AFS lens! Rob Galbraith's ISO samples from the new D3! 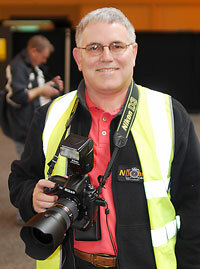 Volunteer at the upcoming Nikon Solutions Expos!!! Rob Galbraith has posted a very nice summary article featuring Nikon D3 samples ranging from base ISO200 all the way to the stunning ISO25600. While many of the photos have been seen piecemeal across the Internet, Rob puts it all together in a very readable format along with full details about how the photos were taken and what in-camera options and post-processing were used. The photos,taken on a pre-production D3, were gathered from the works of noted photojournalists and authors, including Peter K. Burian of Shutterbug fame. Conversion from RAW was made possible through beta copies of Capture NX and PhaseOne's Capture One. Adobe has posted Camera Raw 4.3 and Lightroom 1.3 updates. These upgrades will be of interest to Nikonians since they contain official support for the D3 and D300 digital SLRs due to be released at month's end. For developers, the Lightroom update also includes an SDK to allow communication of photo exports to third-party tools. Tokina has announced a new 11-16mm f2.8 DX and a 35mm f2.8 DX macro lens. Both are designed specifically for Digital SLRs with less than full-frame sensors (APS-C). Pricing outside of Japan was yet to be announced, but initial availability was expected at the end of December 2007. It will be interesting to see market responses to these lenses - the 11-16 (17-25mm equivalent FOV) finally fills a fast lens gap at the extreme wide-end and complements Tokina's existing 16-50mm f2.8 DX and 50-135mm f2.8 DX zooms. Previously, the slot was held by the manufacturer's 12-24mm f4 DX, which continues to be a popular alternative to Nikon and Canon offerings. The 35mm (50mm equivalent FOV macro will have to work hard to distinguish itself in a fairly crowded market. Ever wondered howcome so many smaller photography sites grow so fast? Nikonians strong position is probably a key answer to that question. With a strong Google Page Ranking, Nikonians drive hundreds, if not thousands of other websites, making sure they are getting good search results in the well known search engines. We on the Nikonians team decided some years ago not to block the possibility to link out from our very active forums to other sites. Many other sites are prohibiting this, not allowing posters to include a link to their own website - we do not. If you are using Nikonians message signature to advertise your own site, we kindly request you to link back to Nikonians.org from that very same site you are linking to. Sigma has announced two new fisheye lenses specifically designed for digital SLR cameras. The 4.5mm f2.8 EX DC Circular Fisheye HSM provides an enormous 180 degree FOV down to 5 inches close focusing. Complementing the Fisheye is the 10mm F2.8 EX DC FISHEYE HSM which projects a fisheye perspective into a rectilinear format, and close focuses to 5.3 inches. Both lenses feature Super Multilayer Coating minimizing flare and ghosting, as well as Super-Low Dispersion elements and full-time manual focusing thanks to the HyperSonic Motor. Prices and release dates were not available at press time. 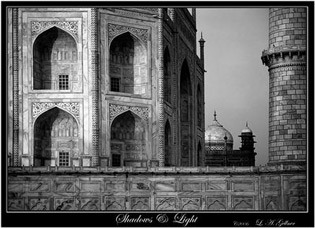 Nikonians Rick Walker (of ImageDoctors fame) and Ernesto Santos are proudly featured in Singh-Ray's Online Blog, showcasing how they used the popular filters in some of their award-winning work. Congratulations Gents! Update 1: Ernesto's article will be published within the next week or so. The Nikkor AF-S 24-70mm f/2.8G ED exceeds the already very good performance of its predecessor. The center quality is nothing short of outstanding matching or beating the resolution of a 10mp APS-C sensor. Nikonians, the worldwide home for Nikon users, are looking for volunteers for the upcoming Nikon Solution expos in London and Cologne, Germany. Nikonians will be participating at the Nikon Solutions Expo in London 27th and 28th November and at the Cologne Nikon Solutions in Germany 30th November and 1st December. 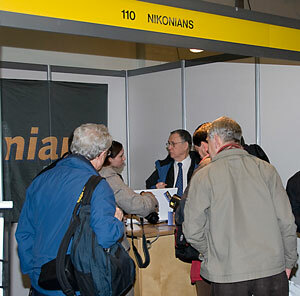 The expos are hosted by Nikon UK and Nikon Germany and entrance is free of charge. Please note that online pre-registration is required - available on the expo websites. Support your community by visiting us at the booths and help out handing out flyers. Check out Vincent Versace's great range of instructional DVDs! "What do you carry without fail?" "Best Photography Book Ever Written?" Are you just getting started in digital photography? Do you feel overwhelmed? Listen as Jason and Rick meet with a novice photographer and give him advice on how to use his Nikon D40x. Also in this episode, Rick and Jason give their hands-on preview of Nikon Capture NX 1.3, slated for release in late November. The popular third-party manufacturer Cosina has created two new manual focus 35mm format lenses for Nikon AIS and Pentax KA mounts. The Ultron 40mm f2 SLII is a pancake lens much like the Nikkor 45mmP, with a dual-aspheric element and a compact footprint. The Nokton 58mm f1.4 SLII will invoke fond memories for users of the Topcon SLR who used similar lenses for a "normal" perspective. Both lenses are marketed under the Voightlander brand. No US sales information is currently available, but the new items should be available in Japan by December with an estimated price of under USD500 each. We have winners in our 100,000-members Celebration! Thanks to Nikon Europe and The Nikonians PhotoProShop for prizes. More to come! 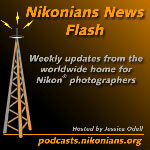 The 35th edition of The Nikonian is ready for download. Thanks to members for help with the NikoScope Beta improvements. Check out the forums! Nikon appears to be bundling Capture NX 1.3 with a limited number of new D3 and D300 purchases. Find out more in the news blog. 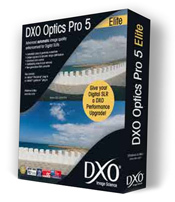 DxO's Optics Pro v5 is ready for purchase in mid-November. Listen to The Image Doctors talk with Nikonians founders Bo and JRP! 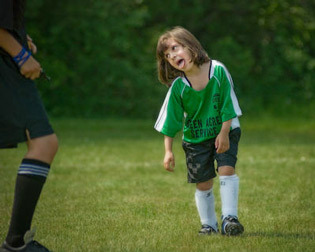 November's Online Photo Assignment is Group Struggle. Any Nikonians in the Oklahoma City area? Hear a brief interview with Nikonians founders Bo Stahlbrandt and J. Ramon Palacios with "The Image Doctors" at the recent Nikonians ANPAT in Jackson, Wyoming. Click here to download Nikonians Podcast #10 (NPC-2007-11-04; 10:46; 3.9MB, MP3 format). Bo and JRP give their impressions on the state of the Nikonians community in 2007 and tell of more good things to come in the near future. DxO's new Optics Pro version 5 will be ready for mid-November purchase, and the upgrade availability for owners of previous versions includes free upgrades for many recent v4.5 purchasers as well as discounts for previous version owners. The mid-November release will be for the Windows version with the Macintosh platform following by the end of the month. Here's the good news for those who have purchased DxO Optics Pro v4.5 on or after August 1st, 2007: you are entitled to a free upgrade to version 5. (Make sure you factor in your local sales and value added taxes). The new Optics Pro version 5 features a new user interface. It makes radical advances in RAW development with a new demosaicing engine and includes a new dust removal tool with technology for RAW images. It also extends the existing library of camera and lens correction modules with support for the latest Nikon Digital SLR camera bodies. NikoScope.com - Our own search portal for finding photography friends and anything on Nikon, just got better. As of November 1, 2007, NikoScope provides the "Advanced Search" feature for our forums. Throughout the development process, this search engine is being refined with the help of our members. The Advanced Search feature allows you to select which forums should be searched, for how many days, by author and how the results shall be sorted (by number of replies, number of postings or search term relevance). Nikonians have been assisting our development team by participating in a lively NikoScope Beta discussion in our Café Forum and their feedback is helping shape the final product. The Development Team constantly monitors the discussion to help fine-tune the search engine specifically for the needs of our members. Nikonians can also contact the Development Team directly by using the provided link at the bottom of the NikoScope page, which provides a dedicated email address. The page also provides background information on NikoScope, which is being developed by enprovia® Software Engineering.